The only other previous live album in the Voivod catalogue being 2000’s Voivod Lives, the time for a new live recording of Canada’s second-best band is long overdue. Sadly, Piggy’s death in 2005 has meant that the magic of the classic line-up of the band is lost forever. Fortunately for all, his replacement Dan Mongrain (Chewy, in Voivod-speak) could be a clone of the late great guitarist, so well does he fill his shoes. It suggests the band will continue as strongly as they have been, perhaps stronger now that a new riff-writer can be used instead of pilfering the dwindling Piggy stock – no disrespect meant to Denis D’Amour, but as good as Katorz and Infini were, the time for new blood and ideas was approaching rapidly. As a first test of Chewy, his ability to replicate the band’s past hits is vital, and Warriors Of Ice shows him passing with flying colours. Recorded in a small concert in Montreal all the way back in 2009, it’s one of the best live albums you’ll hear, the sound noisy and organic without being of poor quality, and the songs as powerful and direct as their studio versions. Quite a setlist is presented here, drawing material mainly from Voivod’s classic pre-90s years (which gives them a big choice!) with a few newer tracks to spice things up. What surprises is that it all flows together perfectly, the opening Voivod’s early thrash rumble fitting right next to the proggy The Unknown Knows and relative poppiness of The Prow perfectly. And these are just the first three tracks – the seventy-minute running time is more than generous. You can place this credit for this expert conformity on the band themselves, who form an expert unit. Chewy slots right into Piggy’s place, as mentioned, cranking out the bendy riffs and wonderful leads perfectly, yet the other three deserve bags of kudos too. Frontman Snake (unbelievably fifty years old!) fulfils his role with joyous enthusiasm, belting out the lyrics in that unmistakeably sneery yelp and talking to the crowd here and there in speedy French, even amusingly leading the crowd in a football chant before Tribal Convictions. He’s backed well by bassist Blacky (back in his rightful place!) clearly audible, and drummer Away, who’s very underrated as a sticksman, capable of thrash blasting and more proggy complexity seemingly at once. 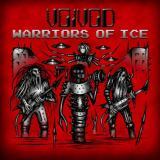 I don’t always enjoy live albums automatically, finding it all too easy to nitpick, but Warriors Of Ice never found me once without a grin on my face. Blame it on being a fanboy, but I can only say that this absolutely rocks, and builds on the strong material to offer the perfect present for a fan of the band. My one criticism is that some of the tracks have been snipped a little too finely, meaning you can hear crowd noise being cut off. Yet with songs as good as Nothingface and Brain Scan, who could really complain? Even newer cuts like Global Warning and Treasure Chase come across perfectly in live form, the latter’s Queens Of The Stone Age-on-speed approach as wonderfully demented here as any other track. By the time the closing duo of Nuclear War (utterly insane) and the band’s brilliant Pink Floyd cover of Astronomy Domine roll around, you’ll be as worn out as if you’d attended the gig yourself. Voivod have done themselves, and the fans, proud with this one.